Engine is GWR saddle tank but the box looks more like LNWR. The first word of the name, an unhelpful SOUTH, is all that can be seen so not much to go on. The signal cabin is not LNWR. Vertical boarding, no finials etc. 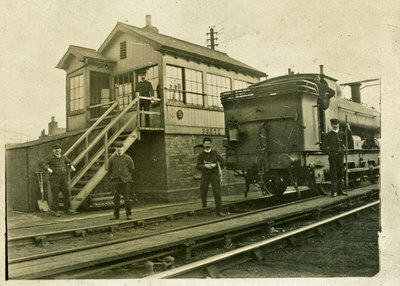 It is an fact a GWR Type 3 and a photo of an almost identical box appears on page 160 of �The Signal Box� (OPC). Looking at the GWR Signal Box Register, I would guess that the box is South Dock (Swansea). This is not an LNWR signal cabin. The Signalling Record Society's book The Signal Box (OPC, 1986) has a photo of a very similar structure on p161, described as a Great Western Railway "Type 3" box. This seems to date its construction to between 1880 and 1889. Whether "Type 3" was an official GWR description or not, I do not know. But, as the same book contains references to LNWR boxes of "Type 4" etc, from a system concocted - simply for convenience - by enthusiasts in the 1960s, I suspect this GWR type-numbering may be similarly unofficial. The authors of the book �The Signal Box� make it clear that �The �Type� classifications of signal box designs used in this book are entirely our own invention, and in no case do they represent contemporary terminology�. John Morris and I were responsible, with a little help from Garth Tilt, for drafting the GWR SB type numbers (just like RDF did for the LNWR). As Philip states, this is explained in the introduction to �The Signalbox�. This is indeed a GWR type 3. Very many were built on the GWR south of Oxford and Hereford in the 1880-89 period, before being superseded by type 5 (don�t ask about type 4!!). Philip may well be right about South Dock, as symmetry would indicate that the second word is quite short. See �Atlas of the GWR� by Tony Cooke. Most of them were quite small as demanded by signalling installations of the period, this one is larger then most but by no means the largest. Sorry to go on about a �foreign� railway, but I find a broad-minded approach gives very useful insights. And, to give due credit for the LNWR signal—box Type numbering system, I believe it first appeared in print in the ‘Model Railway Constructor’ of February 1971, in an article by Philip Millard — no less! As long as we all agree about which designs of cabin these Type—numbers represent, it can do no harm.